Returned persons from Kasala village, Kasaï Province, awaiting food distribution by the NGO COPROMOR and Christian Aid. “The Kasaï crisis is an acute crisis of massive proportions in a country that is already going through one of the world's most relentlessly acute humanitarian emergencies,” the Humanitarian Coordinator in DRC, Mamadou Diallo, said in Kinshasa. “We are facing a new challenge that requires additional resources to respond to the needs of thousands of displaced people and host families as our current capacities are being outstripped,” he added. According to the UN Office for the Coordination of Humanitarian Affairs (OCHA), more than one million people are estimated to be currently displaced as the violence started in Kasaï Central and rippled across neighboring Kasaï, Kasaï Oriental, Lomami and Sankuru provinces. Currently some 40 national and international humanitarian organizations are working across the five provinces to respond to the crisis, which was borne out of armed clashes that erupted in August 2016 between the Congolese army and a local militia group. The appeal launched today will provide water, food, medicines and health services, basic household items, and provide protection services, among others, to minors, women who have suffered sexual violence, and other civilians who have been victim of violence. In Kasaï Central province alone, the current humanitarian needs are 400 per cent above what humanitarian actors had planned for earlier this year. “An effective response requires that new and fresh funding be allocated as humanitarian actors cannot afford to take away from their current operations in the eastern provinces to support the Kasaï crisis,” Mr. Diallo said. More than four months into the year, the 2017 Humanitarian Response Plan only received $66 million, or less than 10 per cent of the overall $748 million appeal. 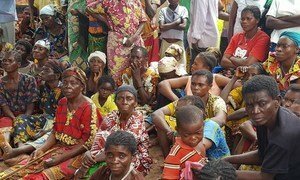 The United Nations migration agency released emergency funding in the amount of $100,000 to kick-start relief operations in Angola for the 1.1 million Congolese displaced by fighting in the Democratic Republic of the Congo’s (DRC) south-central Kasaï region.